October courses begin officially on September 12, the focus weekend takes place October 8-9, and final assignments are due November 11. If you would like to audit a course, the tuition is $100. If you would like to take the class for credit, the tuition is $180. The cost includes meals and overnight accommodations at Upton Hall on Friday and Saturday night (on a space-available basis). If you wish to take the class for credit, we encourage you to enroll by September 11, as October classes officially begin on September 12. However, if you wish to audit the class, you may register at any time prior to the focus weekend. Old Testament I will focus on methods for biblical study, major topics like covenant, law, and prophecy, and will provide students with a clear sense of historical and cultural context for these materials. While this is a survey, it will emphasize those “must know” concepts, personages, events, and literary genres essential to a basic knowledge of the Old Testament. Dr. Victor Matthews is a Professor of Religious Studies and Dean of the College of Humanities and Public Affairs at Missouri State University. He holds a Ph.D. in Near Eastern and Judaic Studies, specializing in the social world of ancient Israel. He currently serves as the Chair of the Board of Examining Chaplains for the Diocese of West Missouri. This course introduces students to the two dimensions of social witness in the New Testament. The first is the social and cultural world dynamics found within the context of the first-century Mediterranean world. The second examines select New Testament writings that challenged the social conventions of the first-century and also the contemporary world. 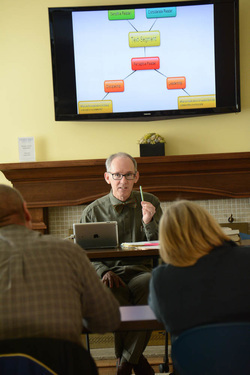 Dr. David May has taught at Central Baptist Theological Seminary since 1994. May graduated from Northwest Missouri State University in Maryville, MO, with a B.S. in History (1980). He received a M.Div. in 1983 and a Ph.D. in 1987 from the Southern Baptist Theological Seminary in Louisville, KY. Dr. May’s writings include Preaching Matthew: Interpretation and Proclamation, which features a socio-rhetorical homiletic combined with cultural exegetical interpretations. Another writing area of interest is Revelation as seen the publication of Revelation: Weaving a Tapestry of Hope. For Dr. May’s blog on topics related to New Testament studies, visit www.ntstudies.wordpress.com. This course provides an introductory survey of the history of the Church in Britain. Attention is given to: the Celtic contribution to British Christianity; the Synod of Whitby and after; the Medieval period with emphasis on the struggle between church and state; the Reformation on the Continent; the Reformation in England, and the unexpected consequences of the Reformation on the Church and the western world in years that followed. The primary focus of the class is on the ancient and modern catechumenate, especially in terms of preparation for baptism and confirmation. The course will also look at other formation issues for adults, particularly vocational discernment and spiritual direction. Westerhoff, John H. III. Will Our Children Have Faith?